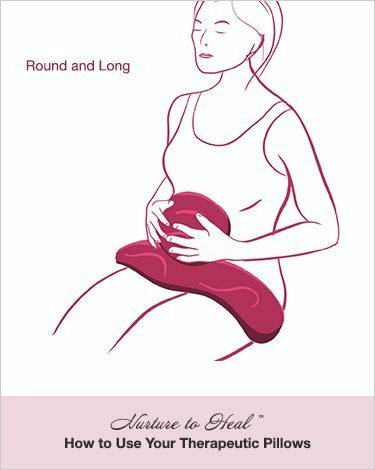 Lying face up stretch the pillow on your midline from the clavicular joint to the pubic bone. 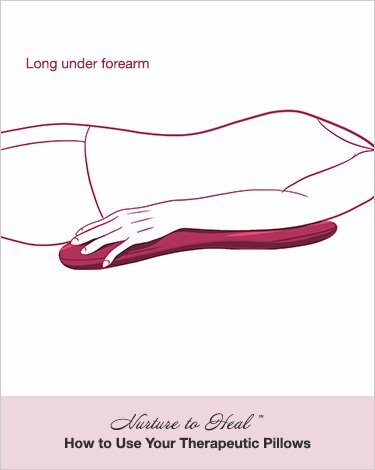 For spinal support stretch the pillow on a comfortable surface. Spread the seeds evenly or bunch them in specific areas for extra support. 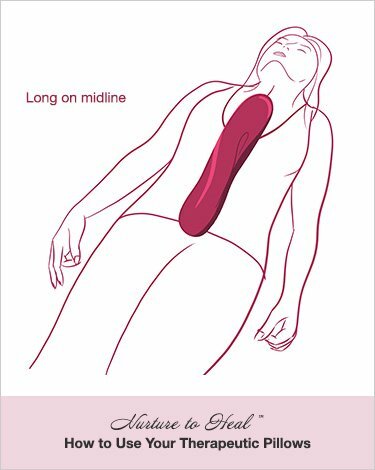 Lay down centering your spine on the pillow from your tailbone to the base of your cranium. 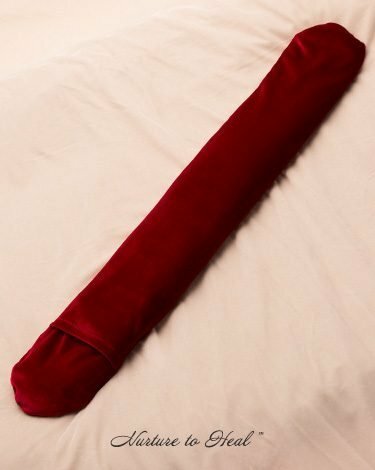 The Long can also be used as a wrap on any part of your body. The Long Segmented has pockets that hold the seeds in three sections. 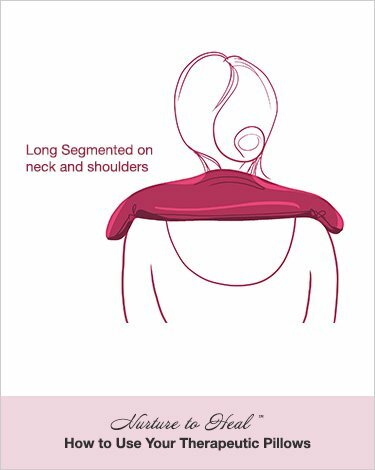 Ideal for the shoulders when your client is in the seated position. The cover can be removed for washing, and replaced. 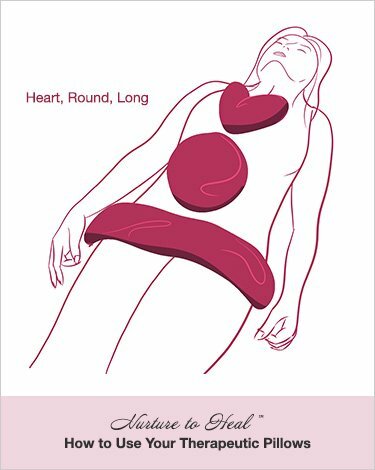 Nurture To Heal™ Therapeutic Pillows evolved out of our desire to create a tool that would support and enhance somatic awareness. 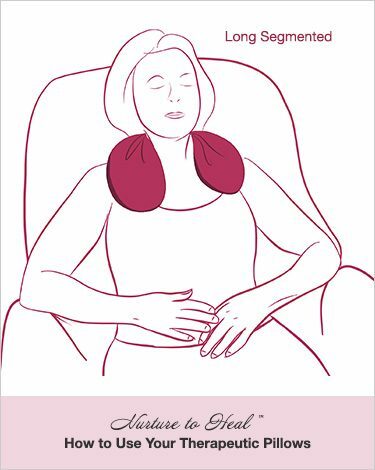 We wanted to develop a therapeutic comfort tool for self-regulation and self-care that NeuroAffective Touch® practitioners could use and give to their clients. The outcome has exceeded our hopes. Professional psychotherapists, bodyworkers, and everyone who can benefit from tender self-care and who struggles with nervous system regulation have found them useful. All Nurture To Heal™ Therapeutic Pillows are made of luxurious deep red stretch velvet. Filled with organic flax seeds, they are soft and malleable. They can be warmed in the microwave or cooled in the freezer. Pleasingly tactile and sensuous, the pillows are a valuable resource to support self-regulation, encourage soothing self-care, and heighten body awareness. 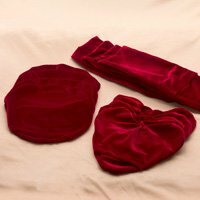 We believe that once you use them and discover the special effects of each shape, you will find that you can’t be without your collection of pillows. 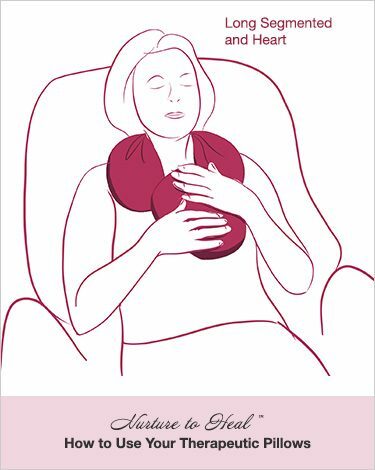 Contents: The Nurture to Heal™ Therapeutic Pillows contain unscented, food grade organic flax seeds only. 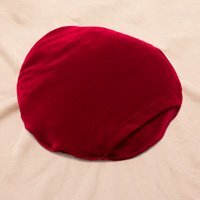 The cover is made of stretch polyester velvet. DO NOT STACK OR OVERHEAT as flax seeds may burn! Long and Long Segmented: 2.5 minutes. WARNING: Misuse can result in fire or melting of your pillow! Place your pillow in the freezer in a sealed plastic bag or container to keep it free of moisture. Remove excess air before sealing the bag. Leave as long as needed to cool. 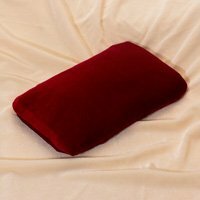 You can store your therapeutic pillow long-term in the freezer if you like to use it cold. Pillows remain pliable and soft when cold. 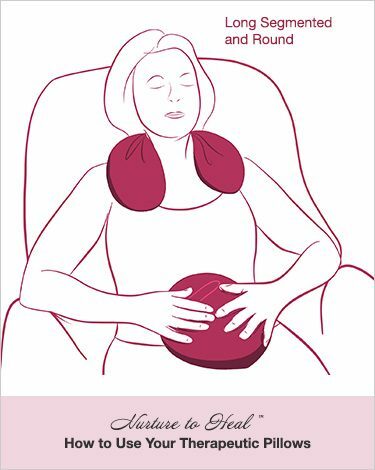 Cool use is excellent to calm inflammation. If any medical conditions exist, use caution or check with your doctor before use. Do not use with infants and young children without supervision. Do not leave in a moist environment for any extended period of time as flax seeds may sprout! Pillows contain flax seeds. Do not leave pillows unattended around animals such as birds and chickens who love seeds! Allergies: Do not place directly on the skin if you or your clients are allergic to flax seeds. If an allergic reaction occurs, please call 911 or go to your nearest urgent care. Outer covers are removable and can be washed. Dry on a delicate setting. 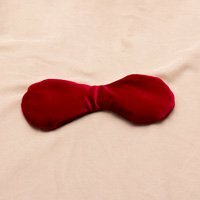 DO NOT WASH the black inner pillow containing the seeds. The Mini and Original Heart have no outer cover. Spot clean only. For health reasons, if you use your Mini on the eyes of multiple individuals, use a protective barrier like a tissue. Storage: Store in a clean, dry environment away from moisture, small children, pets, and birds. Our goal is your total satisfaction. If for any reason you are not completely satisfied with your Nurture to Heal™ purchase, simply return the pillow in its original condition within 18 days of purchase and we will give you a full refund, plain and simple. Returned items must be in original, new condition, showing no signs of wear or use such as odor from excessive heat or perfumes, skin oil, or lotion stains. No reimbursement will be given for damaged items. Items need not include original packaging and instructions. Your refund will be promptly processed in 2-3 business days. Refunds are made for product value only, excluding shipping and handling charges. If you received a discount on your order, this discount will be deducted from your refund. Shipping fees are the responsibility of the purchaser. For returns, please email victor@nurturetoheal.com for a return authorization and further instructions. 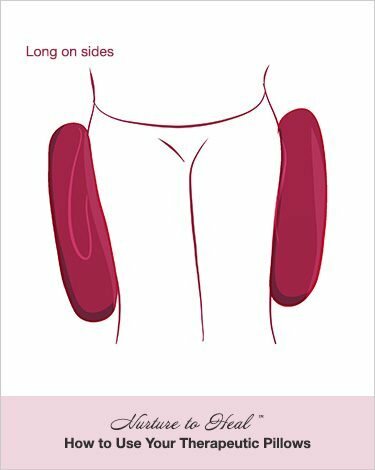 Your Nurture to Heal™ Therapeutic Pillow has a limited lifetime warranty under normal and customary use to be free from defects in workmanship and materials. If, for example, under normal use a seam opens and seeds leak out, your pillow is warranted and will be replaced with the same pillow model or its equivalent. Any misuse, including but not limited to overheating causing the fabric to melt or a strong burnt odor, water damage, tearing by animals, pets, or vermin shall not be warranted. This Limited Lifetime Warranty ends at the time the item is discontinued, plus one year after its removal from production. In addition, the warranty is in effect only as long as the original purchaser owns the pillow. The NeuroAffective Touch® Institute is neither a regulatory nor licensing organization and therefore not sanctioned to certify, license, or otherwise bestow the legal authorization to practice as a mental health professional. The NeuroAffective Touch® Institute reserves the right to approve or deny any application to any training or membership, revoke approval at any time, and approve or deny the participation of any person, at its sole discretion, with or without cause, and in accordance with its policies and the law.